You've a lovely garden, very colourful. Should be in a gardening magazine Janey, it's perfect ! Definitely gone to my favorites. I agree, such a pretty scene. Hi Janey, this is a beautiful setting!! Beautiful display of colours, gerat photo. Flcrazy........lady of the silver tongue, or should I say fingers...Lol!! Just telling it like it is Janey...:-). Your photos really do a body good ....lol ! Really beautiful, a pretty photo and a pretty garden. 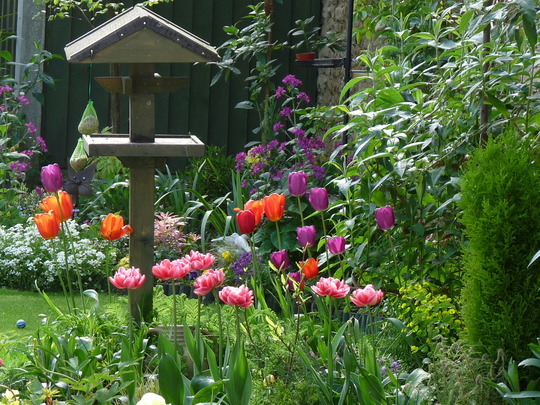 Just found this picture, splendid garden, the tulips do you proud. Aw thanks Moti......yes, we're going the right way...:o) I noticed today...still light at 4:50...yippee!! yeah,mine too.cant wait to have them around again. I love the combination of colors, textures and shapes here Janey. Thanks Gg.....I'd forgotten about those pink tulips...only 3 months to go...:o( Lol! My tulips are already pushing up through the ground; I believe mid winter on the calender is actually early spring around here. Oh that's great Gg.....Arizona....mmmm.....hot sun blue sky and desert lizards? Hey how about a house swap till June?? ?...Lol!